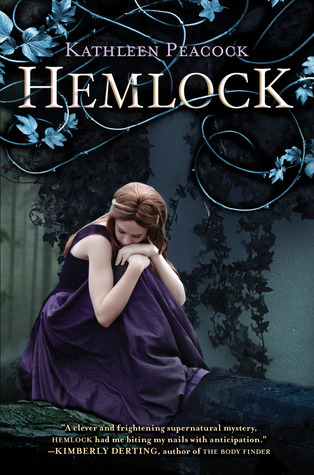 I really wasn’t sure about Hemlock. It had an interesting idea behind it, but I felt like the werewolf storyline could really go bad. It had the potential to end up kind of cheesy and unbelievable. Somewhere between the first few chapters and a third of the way through the novel, all my fears were gone and I was hooked. I stayed up way too late to finish this book, but it was completely worth it. Mackenzie lost her best friend Amy to a werewolf attack five months ago. The wolf was never found and without a sense of closure, Amy is haunting Mac’s dreams. Jason, Amy’s boyfriend at the time, has turned to drinking and bad life choices to forget. Kyle, the last member of their group, has tried to be there for his friends, but he’s had to deal with Amy’s death as well. When there’s another werewolf attack in town, the past is brought back up and the three of them must face secrets that threaten not only their friendships, but the town as well. Mac is a perfectly flawed character that works to overcome her demons. She’s not a strong fighter or the best thinker, and she lets the past cloud her judgment, but she fights as hard as she can for those she cares about. She isn’t softhearted, but she is sympathetic to the werewolf plight, even though one killed her best friend. She knows one is not a reflection of them all and she believes they still deserve to have rights. She’s worried about the people she loves leaving her because her mother left when she was a baby and her father took off a few years later. She keeps everyone at a slight distance so it supposedly won’t hurt as much when they leave her. All of these little pieces come together to create one of the best characters I’ve read in a Young Adult novel. Jason and Kyle are the not-really-a-love-triangle counterparts. Mac cares for both of them, but it is obvious where her heart lies, at least in Hemlock. Jason’s idea of honoring Amy’s death is revenge. He loses himself in the bottom of an alcohol bottle and vows to destroy the creatures that destroyed Amy. Kyle feels responsible for Amy’s death and beats himself up over that guilt every day. He doesn’t self-destruct, though, and vows to never let something like that happen to someone he cares about again. Each boy takes drastically different paths when it comes to how they deal with Amy’s death. Having these two complete opposites was interesting to read and made for some extremely tense moments. Hemlock completely surprised me. I really was not expecting to find myself so invested and involved with these characters. The ending has me needing the next book and I’m very happy I waited to read Hemlock because I don’t have to wait for Thornhill. This is a fantastic read that blends the real world and the world Peacock has created perfectly. This is an amazing start to what I hope is an equally amazing series. This entry was posted in Contemporary, Mystery, Thriller, and Suspence, Something a Little Different, Young (and New) Adult and tagged Fantasy, Kathleen Peacock, Mystery/Thriller, Paranormal, Supernatural, Young Adult.